The action brought against Iron Maiden last year for alleged copyright infringement on 'Hallowed Be Thy Name' and 'The Nomad' has been settled in full. Former Lindisfarne manager Barry McKay brought the action on behalf of Brian Quinn, aka Ingham, in May 2017 and you can read all about it right here. The case centered around the Beckett song 'Life's Shadow' from which two verses of lyrics are said to have been used in classic Maiden track 'Hallowed Be Thy Name', as well as a passage of music used in 'The Nomad', a track from Maiden's 2000 album 'Brave New World'. 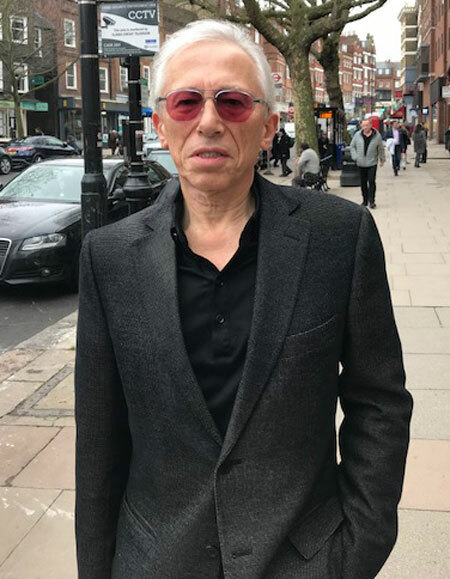 The case was expected to go to the High Court this year with the four defendants, Maiden's Steve Harris and Dave Murray along with Robert Barton and publishing company Imagem London Ltd, being sued for "unspecified damages over £200,000 for alleged copyright breaches". Barton and Quinn are the co-writers of 'Life's Shadow'. Barton had previously been paid off by Steve Harris in a secret settlement which cost the defendants £200,000 for legal costs and damages but failed to disclose at the time that co-writer Brian Quinn, who knew nothing about the secret settlement, had written the lyrics and the guitar solo. The entire claim has been settled in full with the final and total costs to the defendants totalling £900,000. This settlement avoids a trial and Maiden now "have permission to use the previously misappropriated works without further dispute". However, McKay has said that he expects further claims to follow which he is involved with regarding other Iron Maiden songs. Maiden omitted 'Hallowed Be Thy Name' from the setlist during the final leg of last year's 'The Book Of Souls' world tour but due to this settlement, we are fully expecting it to be rightfully reinstated when Maiden hit the road again this May for the 'Legacy Of The Beast' tour. 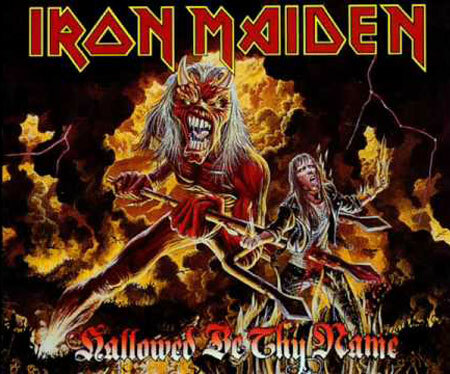 "Back in 1981, Steve Harris intentionally copied two verses of lyrics, which he lifted word for word, from 1970s band Beckett's album, for the definitive Iron Maiden song, 'Hallowed Be Thy Name'. Steve Harris claimed the lyrics as all his own work and since 1982 has solely profited from the substantial publishing income which totalled circa £2m. The lyrics taken from the track 'Life's Shadow' which was on Beckett's eponymous LP, were written by musician Brian Quinn. "Iron Maiden's management failed to produce any accurate earnings figures until both parties had already spent well over half a million pounds on legal costs. Once the lower than expected figures had been examined, both parties agreed to settle the claim. The defendants (Steve Harris and Dave Murray) have paid all of the Plaintiff's considerable legal costs as well as their own legal costs and six figure damages. "This entire matter, brought about by obvious copyright theft has cost Harris and Murray a total of £900,000 in damages and legal costs, for lifting two verses of lyrics, verbatim, for 'Hallowed Be Thy Name' as well as copying music which they used in the Iron Maiden song 'The Nomad', which appeared on Iron Maiden's 'Brave New World' album, released in 2000, eighteen years after the release of 'The Number Of The Beast' album which contained 'Hallowed Be Thy Name'." "Certain members of Iron Maiden, and those representing them, have astonished me by the risks they took in exploiting the works of other writers without acknowledging them or crediting them and in so doing, they personally profited while at the same time deceiving Iron Maiden fans as to who really wrote or co-wrote Iron Maiden material. "Steve Harris's defence was a shambles and my only regret on settling this case is that Harris has avoided being questioned under oath in the witness box, on not only this particular matter but also as to the authorship of numerous Iron Maiden songs. "In paragraph 13 of the defence Harris admitted that 'the lyrics of 'Hallowed Be Thy Name' reproduce a substantial part of the lyrics of 'Life's Shadow'', however, Harris's lame excuse for this was that he composed the lyrics for 'Hallowed Be Thy Name' in early 1982, only using the words from 'Life's Shadow' as 'guide lyrics' and intending to replace them before the final recording. "It is then claimed by Harris that producer Martin Birch and Iron Maiden managers Rod Smallwood and Andy Taylor told him that they did not have time to re-record the vocals prior to the beginning of the tour. This excuse is untrue because Harris could not have written the lyrics in 1982 while in the studio because Iron Maiden performed the song live in 1981 with the lyrics as they are now and always have been. "Paragraph 21 of the defence is remarkable as this shows that Steve Harris as well as his managers, Rod Smallwood and Andy Taylor, who founded the Sanctuary Group which encompassed music publishing, did not bother crediting the writers of the Beckett album track 'Life's Shadow'. Instead they allowed Steve Harris to take all of the credit. This is even more astonishing given the fact that Rod Smallwood had previously been Beckett's agent, before managing Iron Maiden and that 'Life's Shadow' was Beckett's best album track which they performed on stage using a sword as a stage prop. "Clearly Steve Harris was highly influenced by 'Life's Shadow' when he wrote 'Hallowed Be Thy Name'. Harris was a known Beckett fan who also owned the album (which had the lyrics printed on the inner sleeve) as well as regularly attending Beckett gigs as a teenager. "In paragraph 22 of Steve Harris's defence, he ludicrously claims that he thought he did not need permission to use 'Life's Shadow' lyrics. This contradicts what he claimed in paragraph 13. Harris also states that he had 'previously used wording from the Coleridge poem, 'The Rime Of The Ancient Mariner' (for the Iron Maiden track of the same name) without objection. The Iron Maiden song, 'The Rime Of The Ancient Mariner' was actually first recorded and released in 1984, two years after 'Hallowed Be Thy Name' was recorded, on Iron Maiden's 'Powerslave' album. 'The Rime Of The Ancient Mariner' by Samuel Taylor Coleridge was written in 1797–98 and published in 1798. Copyright on the original work expired in 1905 which means that no permission was needed to copy the original Coleridge poem which is of course why there was no objection. "In paragraph 37 it is claimed that none of the music of 'Life's Shadow' was copied when writing the music of 'The Nomad'. It is claimed that any similarities are the result of coincidence. This is simply not believable, especially given Harris was such a major Beckett fan and the musical sections halfway through both songs are almost identical. "In paragraph 16 it is stated that 'The Number Of The Beast' was written by Harris under significant time pressure in January and February 1982. This is incorrect because Harris did not write the entire album in that two-month period, far from it. Live recordings exist of 'Hallowed Be Thy Name' and 'The Prisoner' performed the previous year, 1981, 'Invaders' is a re-hash of an old Iron Maiden song called 'Invasion', '22 Acacia Avenue' was originally an Urchin song called 'Countdown' and according to Bruce Dickinson, he made a significant contribution to the songwriting of that album but was unable to be credited for contractual reasons. "This entire legal action mainly related to and stemmed from Steve Harris's dishonest actions. Defence points 16 to 23 were quite ridiculous, however point 21 revealed that Rod Smallwood, who is an experienced manager, knew about this copyright theft and yet he did nothing to stop it. As former manager of various musicians including Lindisfarne and the late Alan Hull, during that very same period, I would never have sat back and condoned such behaviour, nor would Alan Hull or Lindisfarne or anyone I have ever worked with have ever stolen the music and lyrics of other fellow songwriters and in so doing, cheat them and deprive them of their rightful song-writing credits. This begged the inference that Rod Smallwood and Steve Harris had made a deliberate decision to defraud. "'Hallowed Be Thy Name' isn't just an Iron Maiden song. It's the song that has defined the band and put them on the map in 1982. It's the bands favourite song and the fans favourite song. The song is heavily influenced by 'Life's Shadow' but in particular two verses from 'Life's Shadow' had been lifted, word-for-word, along with a line from another Beckett song. "Brian Ingham (Quinn) was cheated by co-credited writer Bob Barton, (a) when Barton claimed a writing credit based on immaterial changes which certainly did not improve the original, (b) when Bob Barton claimed a 50% share of royalties for himself when he registered the song with PRS in the 1970s without reference to Brian, (c) when Bob Barton increased his claim to 75% share of royalties for himself in 2011 (after discovering that Iron Maiden had used Brian Quinn's lyrics) when he re-registered the song with PRS without reference to Brian Quinn; and (d) when Barton secretly settled his claim against Iron Maiden without reference to Brian Ingham (Quinn) in 2012 - having falsely claimed to have written ALL of the lyrics. "Brian Ingham (Quinn) was cheated by the Iron Maiden parties - particularly Steve Harris and Rod Smallwood when they copied the lyrics and music in 1982 without crediting Barton and Ingham/Quinn and again when they secretly settled with Barton in 2012 without reference to Brian Ingham (Quinn). "Steve Harris's defence would be very funny if it was not such a serious matter involving the deliberate concealment of the identity of composers as well as the deceiving of fans as to who really wrote or co-wrote Iron Maiden material. Furthermore, Steve Harris stole these lyrics from the song 'Life's Shadow', composed by two Geordie songwriters, one of whom, Bob Barton, was secretly paid off by Steve Harris six years ago, on condition he could not speak about the deal. This begs the inference that Steve Harris wished to keep the secret deal quiet, not only from fans but from Brian Quinn. "The Iron Maiden parties secretly settled with Bob Barton but they made no attempt to contact Brian Ingham (Quinn). They gambled on never having to defend a future claim from Brian Ingham (Quinn) and lost. Where two individual's rights have been infringed you obviously can't settle both claims by only secretly dealing with one of them. McKay also revealed that even before this claim was settled, he was already speaking with Iron Maiden's management about a number of other claims against Steve Harris, concerning more of Iron Maiden's music and lyrics that he alleges should have been credited to others. 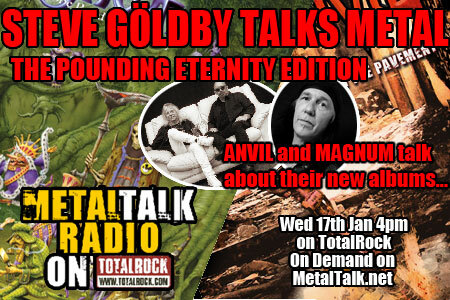 "Steve Harris and Dave Murray have been deceiving Iron Maiden fans for decades as to what they say they have written. 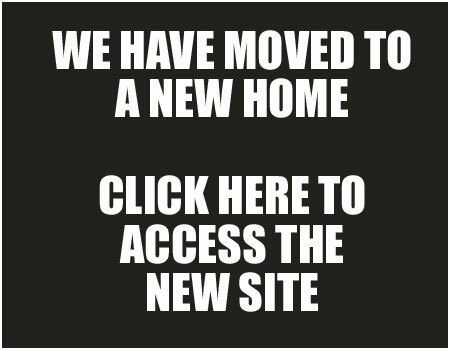 I expect further claims to follow. "It is ironic that since 1976 I have always been on the side of musicians against big business but in this case I have been on the side of a totally honest musician against other musicians and I don't like to be in this position. "Perhaps Iron Maiden's manager, Rod Smallwood is used to being just a little too heavy. That does not work with me." 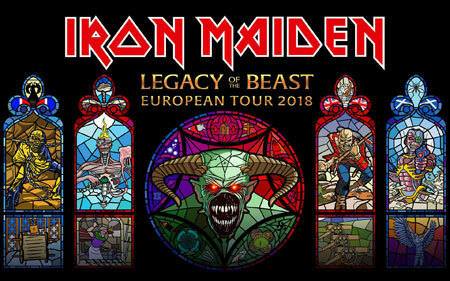 Maiden are to hit the road again in Summer 2018 with a series of arena and festival shows in Europe on the 'Legacy Of The Beast' World Tour opening in Tallinn, Estonia on May 26th and finishing at the O2 Arena, London on August 10th. Tickets are on sale right here. No further countries will be added to this touring schedule and tickets for UK shows and some European dates are available right here. 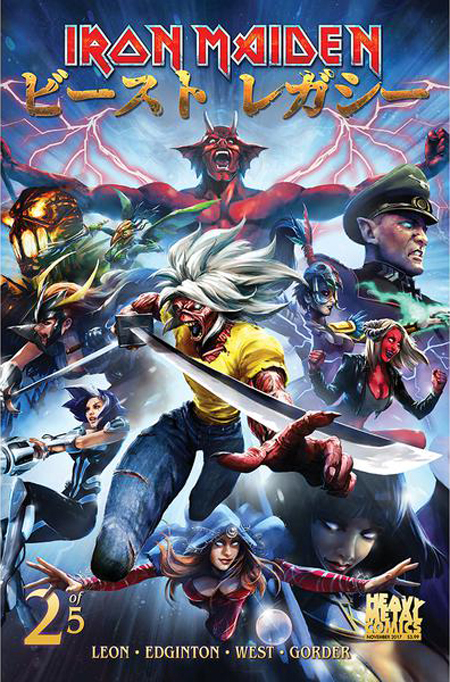 'Iron Maiden: Legacy Of The Beast' is the name of Maiden's first ever comic book and this is based on the hugely successful mobile game. 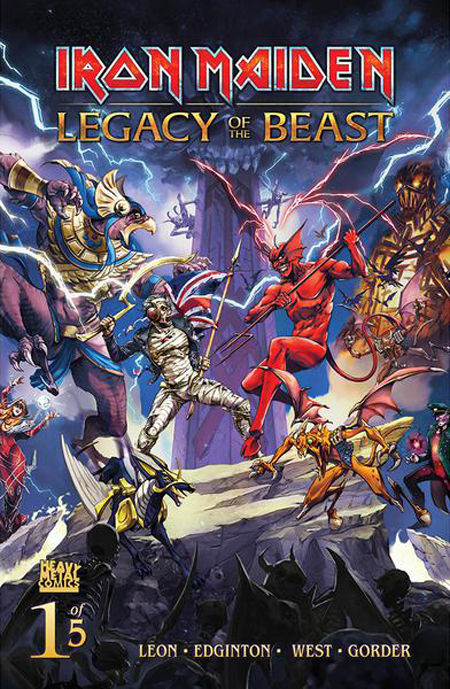 Comprising five fantastic issues, with an overarching narrative and incredible illustrations, 'Iron Maiden: Legacy Of The Beast' is written by Llexi Leon and Ian Edginton, with art from Kevin J West, Jason Gorder and Santi Casas. All five issues are now on sale right here. There are at least three different covers for each of the issues and signed copies and limited editions are available right here. Here's a selection of the covers. "As a lifelong fan of Iron Maiden, it is a privilege to publish the first official comic giving a narrative to their iconic mascot, Eddie. 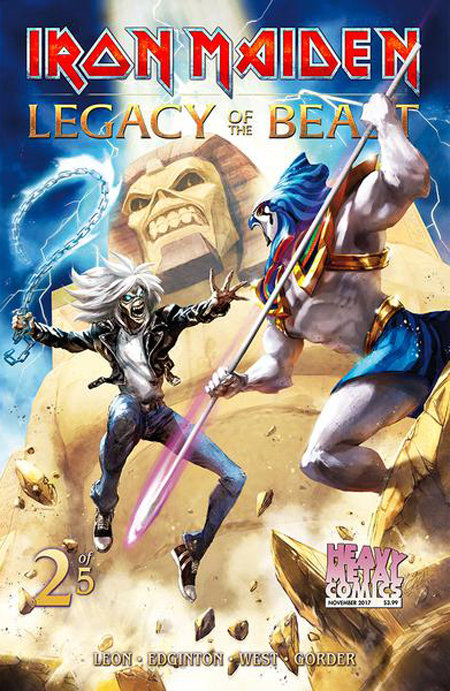 Heavy Metal's near half-century-long history of either working with or launching the careers of only the most accomplished artists continues here with the amazing team Iron Maiden has working on this series." "After forty years of unbridled creativity, innovation, and attitude, Heavy Metal has always been a home to the greatest talent in sequential storytelling and fantasy art. With a natural affiliation to the heavy music genre, it's a nexus point for counter culture and alternative arts. 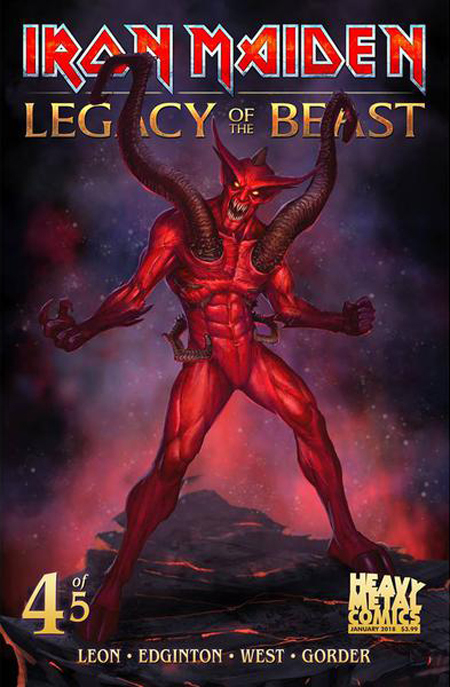 I can think of no better partner to explore Iron Maiden's mythology and expand the 'Legacy Of The Beast'!" Rovio Entertainment, the creators of Angry Birds - a game series that has been downloaded a whopping four billion times - and Mobile games publisher Nodding Frog have completed the migration of Eddie The Bird from 'Angry Birds Evolution' to Maiden's 'Legacy Of The Beast' mobile game. This unprecedented move by Rovio marks a global first for the company, with Eddie The Bird originally appearing in Angry Birds Evolution as a special Halloween tribute to the British Metal legends. Whilst in Angry Birds Evolution, Eddie The Bird - the feathery version of Maiden's iconic mascot - evolved through four classic guises from the band's storied history - Cyborg ('Somewhere In Time'), Pharaoh ('Powerslave'), Killers ('Killers') and Shaman ('The Book Of Souls'). During this time almost twenty million Maiden tracks were heard by hundreds of thousands of players, with a mind blowing thirty-three million minutes worth of Maiden music played in total. Eddie The Bird will now appear in 'Legacy Of The Beast' as all four characters simultaneously, giving players the chance to team multiple birds, as well as deploy them alongside their own greatest allies, with a series of suitably epic events scheduled from the Birds first appearance on February 6th until February 20th, at which point they will fly away and no longer be available in the game. 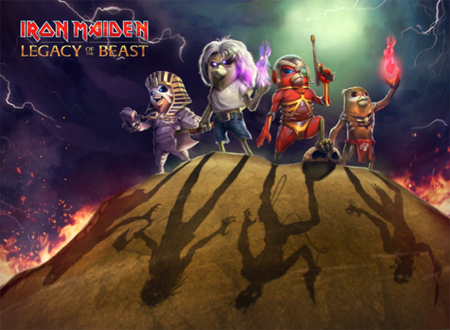 "Rovio outdid themselves with an incredible tribute to Maiden last Halloween and now it's time for players of our own mobile game to enjoy these fantastic characters within the worlds of Legacy Of The Beast." 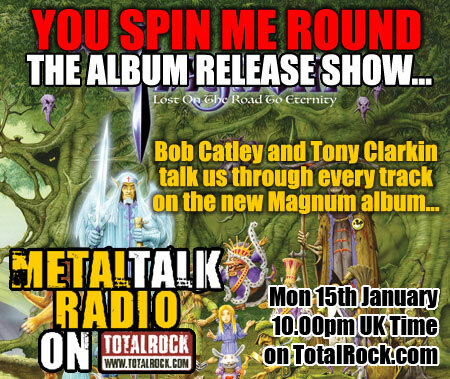 "As huge Metal fans we're delighted to see our tribute to Iron Maiden continue through into Legacy Of The Beast. Eddie The Bird has been a massive hit in our game and we're sure that players of Legacy will have just as much fun with him!" 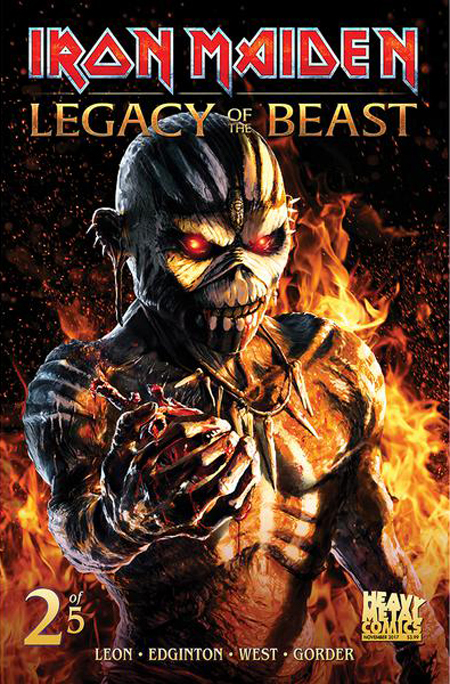 'Iron Maiden: Legacy Of The Beast' is available now for free on Apple's App Store and Google Play.